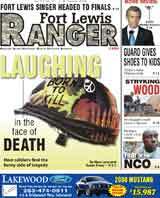 Fort Lewis release. — Approximately 140 Soldiers assigned to the 54th Military Police Co. “Dragon Maulers” will return from a 15-month deployment to Iraq Tuesday, July 29, and will be reunited with their families, at a ceremony to take place around 12:30 a.m. Wednesday, July 30. The company deployed in May, 2007, to Baghdad, to train and mentor Iraqi police. 54th M.P. Soldiers conducted Police Transition Team operations at police stations throughout central Iraq, providing oversight of station operations and training. The Police Transition Teams also provided Iraqi Police with additional manpower in the field when needed, and access to additional coalition resources and expertise. I want to say welcome home to all and a great job done!!! I am a former (WAY former) member of the 54th MPC when it was stationed at Ft Ord (1974-1977). Again welcome home!